Visiting the United Kingdom is every non-British Beatle fans' dream. 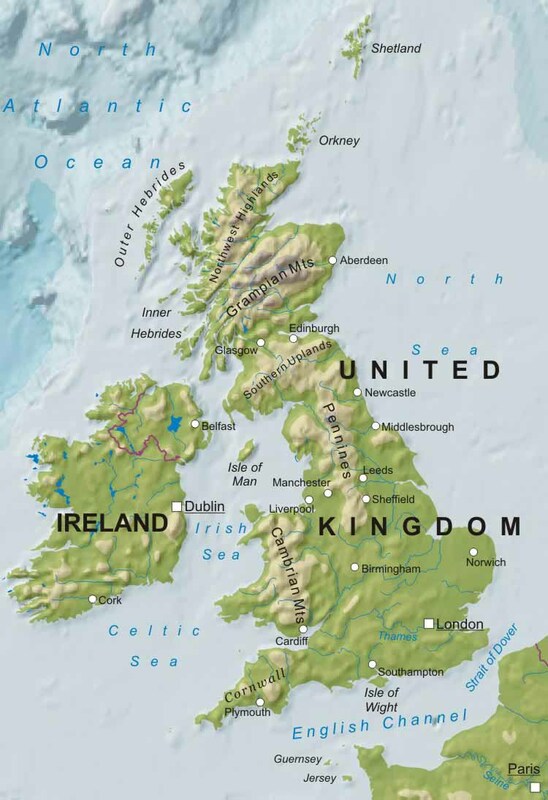 As a native Brit myself, I have decided to create this post to advise those who are going to be visiting Britain for the first time and to make the most out of their experience. 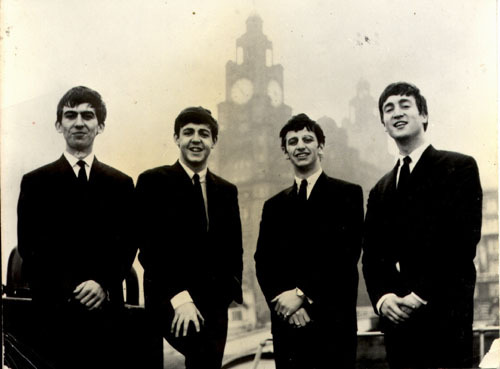 Beatles fans will want to visit England, in particular the cities of Liverpool and London. Liverpool Skyline with the HMS Ark Royal. Liverpool is situated in the county of Merseyside, which is in the northwest of England. Liverpool has the singular distinction of being the true birthplace of John, Paul, George and Ringo in the 1940s and is the city where the Beatles were formed in the late 1950s. 251 Menlove Avenue "Mendips"- John Lennon lived here under the care of his Aunt Mimi & Uncle George, George Smith died in 1955 and Lennon remained in Mendips until he moved out when Beatlemania was in full swing in 1963. Mimi sold Mendips in 1965 and moved down to a bungalow that John had bought for her in Poole, Dorset in the south of England. She remained in Poole until her death in December 1991. Mimi passed away nearly 11 years to the day John Lennon was murdered on 8th December 1980. Mendips was bought by Yoko Ono and she donated it to the National Trust who restored it's interior to how it would have looked when Lennon was living there in the 1950s and now offer tours of the property to fans. 20 Forthlin Road - Paul McCartney's former childhood home which is also under the care of the National Trust. Like Lennon's home, 20 Forthlin road is also restored to how it would have looked when McCartney lived there and is available for tours by the National Trust. Many early Beatles songs were written at 20 Forthlin road and this is what interested the National Trust in the property. Paul McCartney moved out of the home in 1963 and his father, Jim, moved out of 20 Forthlin road in 1965 when Paul bought him a house in the Wirral. Jim died in 1976. In 1995 the National Trust purchased the property and opened it to the public in 1998. 12 Arnold Grove - George Harrison's birthplace. George lived in this house for the first 6 years of his life before the family moved to 25 Upton Green in Speke, another area of Liverpool. Today, 12 Arnold Grove is privately owned and you can view the house's exterior, the interior is not open to the public and probably wouldn't contain any references to George Harrison as a toddler anyway. 25 Upton Green -This was George Harrison's second Liverpool home. He lived here from 1950 to 1963 and this was the house where George's mother Louise encouraged the early Beatles to practice and hone their stage act. This is also still privately owned and not open to the public. 10 Admiral Grove -This was Ringo's second Liverpool home. His Madryn street birthplace was under threat of demolition but plans have been halted, despite Ringo himself saying not to bother as he didn't really remember Madryn street anyway. 10 Admiral Grove can be seen in the 1963 documentary 'The Mersey Sound' when Ringo leaves the house and gets mobbed by kids while getting into a car driven by George Harrison. 10 Admiral Grove is privately owned and not open to the public. St. Peter's Church - Lennon and McCartney met for the first time here in 1957. There is also a gravestone in the churchyard that bears the name 'Eleanor Rigby' which is thought by some to have inspired the song. The Cavern Club - The Beatles performed for a total of 263 times here between 1961 and 1963. This is also where Brian Epstein first saw them perform in 1961. The club closed in 1973 and, in an enormous amount of stupidity by Liverpool city council and British Rail, who wanted to demolish the street level buildings for work to commence on a new underground rail system, the Cavern was filled in to provide foundation for a car park. It remained like a sealed tomb for the rest of the decade and finally it was extensively rebuilt in 1984 and reopened. The club today is estimated to retain 75% of the original club. Strawberry Field - Strawberry Field was an orphanage run by the Salvation Army from 1936 to 2005. Lennon grew up only a short distance away and would attend the annual garden parties thrown in the grounds as a child. In 1966 while filming 'How I Won The War' Lennon wrote 'Strawberry Fields Forever' a song which ensured the orphanage worldwide fame and now the red gates and sign at the entrance is regularly visited by tourists from all over the world. Penny Lane - Penny Lane is a road in Liverpool and was made famous by the song 'Penny Lane' which was largely written by Paul. The song largely refers to the Penny Lane junction between Smithdown road and as such there are a number of familiar references when one visits there. The "shelter in the middle of the roundabout" was turned into the "Sgt Pepper's Bistro" in the 1980s but it failed and has stood derelict for many years. However, there are plans to re-open the cafe in the future. There are numerous other Beatle related sites in Liverpool, ranging from the minor "The Beatles once stood here" to the major "The Beatles once played here" and are too numerous to mention. Some of the bigger attractions are The Grapes Pub, The Jacaranda, The Casbah Coffee Club, NEMS Record Store (although there are plans to demolish the building and put in a Forever 21) and Liverpool Town Hall. There is also the festival 'Beatles Week' that attracts tourists and bands annually every August to celebrate the band. As soon as you enter Liverpool, it won't be long (yeah!) till you see or hear a Beatles reference. In Liverpool, the Beatles are in your ears and in your eyes. 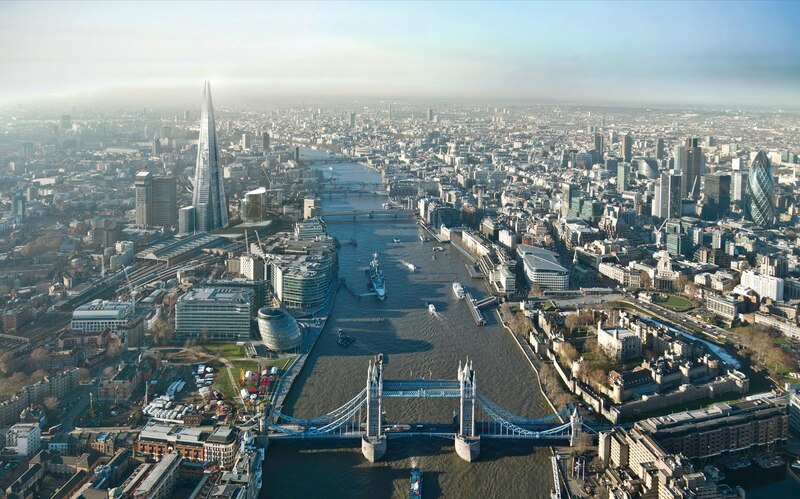 London Skyline looking west with Tower Bridge in the foreground. London is the capital city of England and the United Kingdom and is a famous city all over the world. In 1963 the Beatles and their manager Brian Epstein moved permanently to London, which kicked off 'Swinging London' and its status as the centre of the world was cemented. As such, there are many historic Beatle sites and places in London for people to see. Abbey Road Studios - Where the Beatles recorded all of their albums except for 'Let It Be' which was recorded at Twickenham Film Studios and 3 Savile Row. Abbey Road is a major mecca for Beatles fans who like to replicate the album cover of the final recorded Beatles album 'Abbey Road' by walking across the zebra crossing which is a few yards from the studios themselves. The studios are still in operation today but are not open to the general public. The only way you will get to see the famous Studio Two is by paying for a recording session in there. 3 Savile Row - From 1968 to 1975, the Beatles' company Apple Corps was headquartered in this building. Though the Beatles didn't have much to do with the building after 1970, their brief time here is, like everything else they did, marked in the history books. Filming of the Let It Be recording sessions for their documentary film of the same name was done in the basement recording studio and on the roof of the building, the Beatles gave their last ever live performance on 30th January 1969. These days, the building is unoccupied but is owned by a group that leases out the building. In 2011 they leased the building to Abercrombie and Fitch who had plans to open a store on the historic site. As of 2013 those plans were quashed by Westminster Council so the fate of Savile Row hangs in the balance. It is not open to the public. 7 Cavendish Avenue - This townhouse is just a short walk from Abbey Road and belongs to Paul McCartney who has owned it since 1965. Cavendish Avenue is definitely NOT open to the public but you can walk past. 57 Green Street - The only place where the Beatles lived together. They shared the top floor flat at 57 Green Street in the autumn of 1963. They didn't live together here very long though as Beatlemania was in full swing and as soon as fans found out the address they had to leave. John moved out in late '63 into a flat in Knightsbridge with Cynthia and Julian, Paul moved into his then girlfriend Jane Asher's house in Wimpole Street. George & Ringo were the last to leave shortly after they returned from the Beatles first USA visit in February 1964. George & Ringo moved to Whaddon House with Brian Epstein and lived there until they both bought homes in the home counties. If you are looking to visit the Beatles' former and present homes in the UK, you must be aware that they are private property and that the new occupants may be Rolling Stones fans ;-) But seriously, they will probably be less than thrilled at you being there, so proceed with caution. The Beatles in Liverpool, 1962. OOOOOOOOOOOoooooooooh, I'm taking notes. I plan on going to the UK some day and it will most definitely be to those two places. I've dreamed of seeing London since 12th grade or what the Brits may call 12th form, I think. I plan on making the MOST out of my trip there. Just have to get enough money to go. And who knows? Maybe I'll meet a really hot British guy with a really hot accent? lmao! !